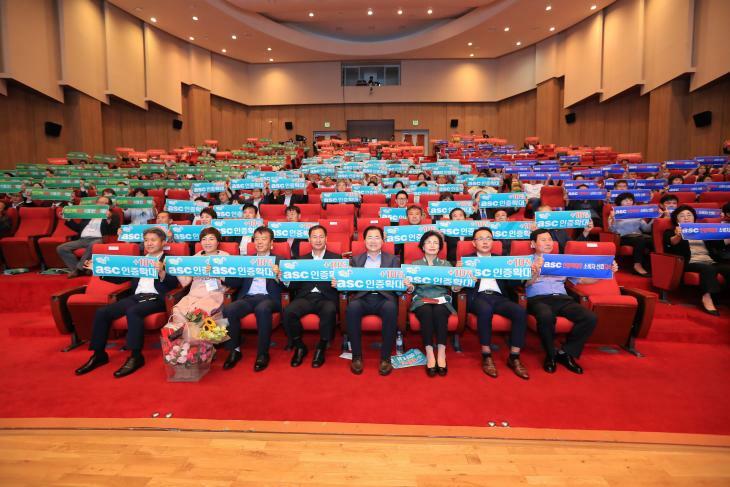 Wando County in South Korea recently demonstrated its commitment to responsible seafood, as a local producer became the first in the country to achieve ASC certification, and the local government pledged that it would be the first of many. Chungsan Fisherman’s Organisation, in the southwest part of the Korean peninsula, produces over 200 metric tons of abalone every year, and held a certification ceremony to celebrate its achievement. Over 150 people, including representatives from the Korean Ministry of Oceans and Fisheries, attended the ceremony, where the conformity assessment body (CAB) Control Union handed over the certificate. It was at this ceremony that the Wando local government announced its commitment that 10 per cent of all seafood produced in the area would be ASC-certified by 2021. This is a significant commitment because the county produces more than nine per cent of all the seafood harvested in the country, and 80 per cent of the abalone. Aquaculture and fisheries are a huge part of the local economy, with 45 per cent of the population depending on these industries for their livelihoods, and there are over 3,000 abalone farms in the region. The achievement is thanks to work that began in October 2016, when the Chungsman Fisherman’s Organisation signed a memorandum of understanding with WWF Korea to work together to shift their farming practices towards greater environmental and social responsibility. The farmers also visited the Miyagi Prefecture Fishery Cooperative Association in Japan, which worked together to attain ASC certification in an area that was once devastated by the 2011 tsunami. “As Chungsan Fishermen’s Organization became the first ASC-certified farm in Korea, the Wando Government prioritizes assisting fisheries in shifting towards responsible and eco-friendly seafood production, as part of its seafood product differentiation strategy. By the time when the next Wando Seaweeds Expo is held in 2021, our priorities are to have more ASC certified farms in the county, especially farms for abalone, flatfish and seaweed and to achieve this goal, the county government has been formulating strategies and action plans, such as ASC educational programme for fishers” said Woo-cheol Shin, the Mayor of Wando County.